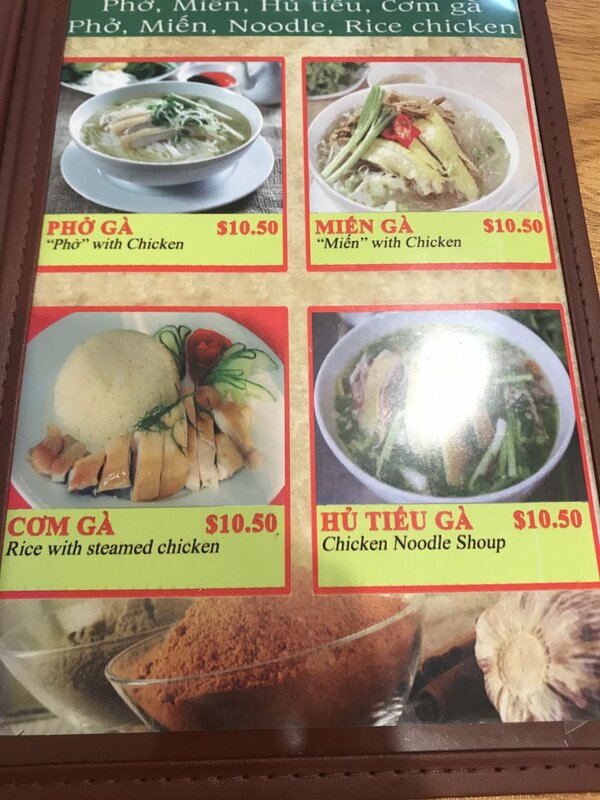 Kien Giang Quan is my go-to place in the Washington metropolitan area for a comforting bowl of Vietnamese Chicken Pho. Located about 9 miles away from Washington, D.C., I was intrigued by the concentration of Vietnamese shops within this aging strip mall during my first visit in Spring 2016. I've been back many times since to explore the various eateries hidden within this sprawling complex and to shop for Asian ingredients at Good Fortune Supermarket. Tucked in a quiet corner within the wing that's furthest away from the supermarket, Kien Giang Quan is a spartanly furnished casual dining restaurant offering a small selection of Vietnamese dishes. I like it when restaurants focus on cooking fewer dishes well than a wide variety of mediocre dishes. The fairly small restaurant was packed during lunch when we first visited but turnover was brisk so diners wouldn't have to wait too long for seats. My favourite dish at Kien Giang Quan is the Chicken Pho (Pho Ga) @ USD 10.50. A lighter alternative to the more well-known Pho Bo (Beef Pho) and its variants, Pho Ga's clear broth is delicately perfumed with spices versus the more robustly-flavoured and darker beef broth. The clear broth was flavourful, a welcome change from the insipid ones served at many other places. The chopped chicken thigh was tender, juicy and a pleasure to savour but I thought the chicken breast chunks were just a little too dry. Then again I've never been a fan of white meat. Kien Giang Quan served Pho Ga Di Bo (Free-range Chicken Pho) when I visited last year. I guess they stopped serving free-range chicken this year as the menu has changed and I verified with a server that they serve regular chicken now. Mien Ga, the glass noodle version of Pho Ga, is my choice on days when I want an even lighter option. The flavourless and transparent mung bean vermicelli goes by many names such as tang hoon 冬粉 in Singapore or fen si 粉絲 in China. This is one of my favourite type of noodles as it absorbs the flavour of the broth without making it bland. Their Mien Ga reminds me of the steaming hot bowl I had many years ago at a dingy stall run by an old lady in Ben Thanh Market in Ho Chi Minh (aka Saigon), Vietnam. Kien Giang Quan serves a bowl of ginger and fish sauce-based dip called Nuoc Mam Gung to go with the Pho Ga. It reminded me of the chili that's served with Hainanese Chicken Rice in Singapore albeit a little less tangy and spicy. Made with fish sauce, grated ginger, sugar, chili garlic sauce and some hot water, it added a slightly spicy and umami flavour to the chicken. My husband is a huge fan of the Bun Mam (Rice Vermicelli with Fermented Fish and Seafood) which I wasn't too keen on because of the strong flavour of Mam Ruoc (fermented shrimp paste). Though I grew up eating fermented beancurd, fermented shrimp paste (eg. belacan and chincalok), and love fermented beans like Japanese Natto, the pungence and funky flavour of Vietnamese Fermented Fish (Mam Ruoc) is a whole new level of of fermentation that I have yet to learn to appreciate. Kien Giang Quan has a nice selection of condiments at the table. There are three types of chili sauce (including Sriracha), fish sauce and Hoisin sauce. Most other places only provide Sriracha and Hoisin sauce at the table and sliced jalapeños with the herb platter. I've been told that they serve a pretty good Hue-style Spicy Beef and Rice Vermicelli (Bun Bo Hue) but have yet to try it as I could never resist their Chicken Pho. Do let me know your thoughts if you've tried their Bun Bo Hue. Most listings state that Kien Giang Quan's terms of payment are cash only but they actually accept debit and credit cards as well. I guess it depends on who is processing your payment. Do visit the restaurant with cash on hand else you can find an ATM in the next aisle. * Prices taken off the menu in June 2017. ** Recommended tips are at 15%, 18% or 20% of the total bill.